Prof George Menachery, Pallinada, Ollur, Thrissur City, Kerala-680 306. Dharamaram College, P. O., Bangalore-560 029. Evershine Nagar, Malad-West, Mumbai-400 064. Prof. Ms. Joan Dias, Victoria Apts. St. Alexius Road, Bandra, Mumbai-400 050. P.O Serampore-712 201, Dt.Hooghly, West Beangal. Rev. Dr. A. M. Mundadan c.m.i. to continue in charge of the History of Christianity in India project. 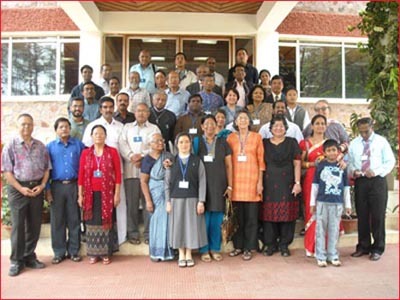 The new office-bearers and members of the Board of Trustees of CHAI, the Church History Association of India elected at the Shillong Triennial. 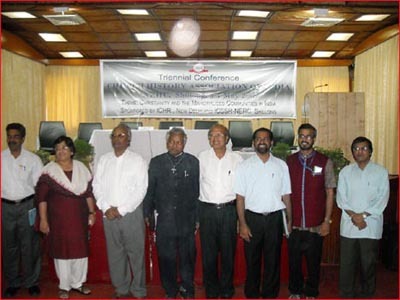 (From left to right):Dr. Varghese Perayil (Member of the BOT), Dr. Agnes de'Sa (Joint Secretary), Prof. George Menachery (General Secretary), Dr. "Cardinal" Thomas Edmonds (Vice - president), Dr. O. L. Snaitang (President), Fr. Sebastian Edathikkavil (Treasurer), Dr. George Oommen (Member BOT), and Dr. Jose Kalappura ( Editor, ICHR). Some of the distinguished participants and delegates at the 14th Triennial of CHAI at Shillong. As Rev. N.Surya Rao , after a period of meritorious and unselfish service, had to resign due to health reasons, Dr. Jos Kalappura was given the additional charge of General Secretary, at the Bombay Governing Body meeting. Dr. S.K. Mitra, Pratap Bagan North, Opp.Mucicipa; School, Bankura-722 101, West Bengal. : Mr. James Elisha, Serampore College, P.O Serampore-712 201, Dt.Hooghly, West Beangal. : Dr.Timothy Hembrom, Bishop's College, 224 AJC Bose Road, Kolkata-700 017. Dr. Leonard Fernando, S.j., Vidyajyoti College of Theology, 23 Raj Niwas Marg, Delhi-110 054. Treasurer: Prof. Ms. A.N.Passah, Dept. of History, NEHU, Nongthymmai, Shillong-793 014. Prof. Mrs. Agnes de Sa,2, Abhilasha, Alpha C.H.S., Saibaba Park, Evershine Nagar, Malad-West,Mumbai-400 064; 022-28822577, a_desa@rediffmail.com.